This stuff is amazing! 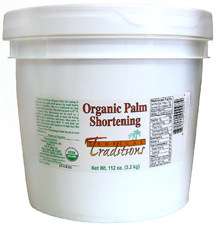 Tropical Traditions Organic Palm Shortening is like nothing I have ever used before. I read on the bucket that it does not go rancid, ever. The melting point is 97 degrees F., making it very shelf stable. It is NOT hydrogenised, and contains NO trans fats! This is amazing for frying or baking with because it does not add any flavor or odor to your foods. I had no idea that anything like this even existed so it makes me extremely excited to have been able to try it out and now I tell everyone about it. If you want to know more about it go right here >> http://www.tropicaltraditions.com/organic_palm_shortening.htm and you can read all about it's qualities, where it comes from and more. I baked banana bread with this, my banana bread came out higher than I have ever seen it rise, it was moist and soft and everything that the best banana bread needed to be. Sometimes shortening can add a really greasy mouth-feel to baked goods but this was not the case with the palm shortening. I pan fried some stuffed chicken breasts with this and it outperformed my usual cooking oil because the smoke point is so high (around 425 F.)! I also baked that chicken pot pie you see above and look at the gorgeous crust I was able to make. The retail price for this 1 gallon bucket is $40.75 but it frequently is on sale and probably is right now! This also comes in a 33 lb size if you need a larger quantity. Tropical Traditions has sponsored a giveaway of 1 gallon of this wonderful shortening shipped right to your door! Enter in the form below.